#WorkingWomenWednesdays featured today on #ThatBusinessShow – as always, catch this segment every Wednesday at 8am on 1250WHNZ where we highlight two professional women from the Working Women of Tampa Bay Networking Group and learn more at http://www.workingwomenoftampabay.com! 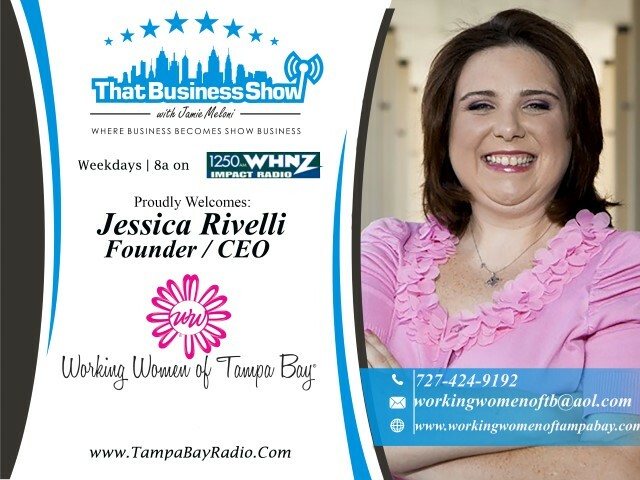 Jessica Rivelli, CEO and Founder of the group kicked off the show with an update on the Working Women of Tampa Bay Conference being held September 10th and 11th at the Straz Center. This amazing conference highlights the successes of women entrepreneurs in the area and has tremendous reach and attendance. Make plans now to attend and visit http://www.workingwomenconference.com for tickets which are on sale now and for listeners of #ThatBusinessShow, use the promo code Meloni2015 for a 10% discount off the ticket. My next guest was Robyn Sayles, Founder of Catapult Creative Consulting. Robyn is an engaging and dynamic speaker and will be speaking at the upcoming Working Women of Tampa Bay conference as well. She and I discussed the Fascinate assessment which is similar to a DISK profile assessment but much shorter and aimed towards showing you how the public views you. I took the assessment and completed it in 5 minutes and got an accurate report on my strengths and weaknesses and Robyn utilizes these in her business to help you determine how to capitalize on your strengths and work on your weaknesses. Robyn is a Fascinate Certified Advisor and she discusses the history and background of this new ground-breaking personality assessment profile that she believes will begin to overtake the DISK assessment and other competitors in the coming years. Attendees to the Working Women Conference who purchase a VIP ticket will also receive a free Express Assessment from Robyn so be sure to remember that when purchasing your ticket to the conference. Learn more about Robyn and her company at http://www.launchingyoursuccess.com and she can be reached at 727-282-5423 or email at hello@launchingyoursuccess.com! 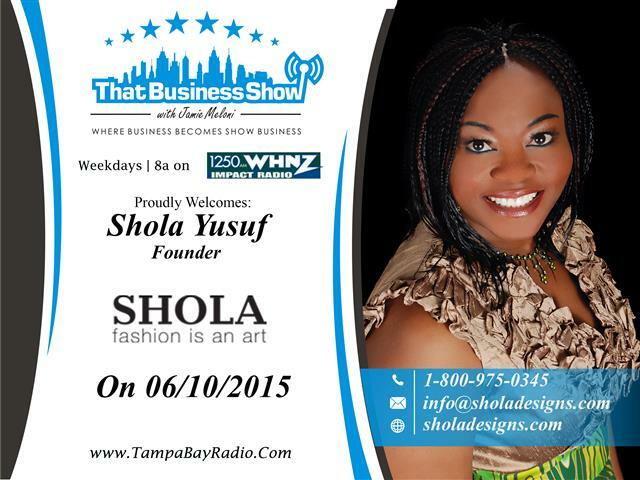 My last guest on the show was Shola Yusuf, Founder of Shola Designs. Shola is an accomplished entrepreneur having a background in pharmaceuticals and owns 4 pharmacies prior to the launch of her company, Shola Designs. Shola, who was inspired by her mother at a young age to enter the world of fashion, launched her company in 2009 shortly after a near fatal car accident. She tells the story of that event at the start of her segment and jokes that upon recovering, her first question to the Doctor was where were her Louis Vuitton shoes. Shola’s primary area of focus in fashion design is shoes and she takes her love for West African culture and design and conveys that to her shoe designs. Manufactured in Italy, these shoes are highly fashionable and named after members of her family and you can view all of her designs and purchase them as well at http://www.sholadesigns.com! Also if you are in the fashion industry and looking for designs to help grow and support, Shola invites you to contact her at info@sholadesigns.com!